Souvenirs. Drew Holcomb has collected many of them. A road warrior for more than a decade, he's spent his adulthood onstage and on the road, traveling from place to place with a catalog of vibrant, honest songs that explore the full range of American roots music. He turns a new corner with 2017's Souvenir, a highly-collaborative album that finds Drew Holcomb & the Neighbors focusing on the things that truly stick with you — including family and friends, music and memories, people and places — in a fast-moving world. Equal parts folksinger, roots-rocker, country crooner, and pop-hook provider, Holcomb blurs the lines between genres on his newest release. Souvenir is his band's most expansive album to date, dishing up everything from the West Coast country-rock of "California" to the front-porch folk of "Mama Sunshine, Daddy's Rain." The rootsy songs are more rustic than ever before, laced with harmonica, upright bass, and banjo, while the rockers are downright electrifying, from the searing guitar solo that carves a lightning-shaped streak through "Sometimes" to the emotionally-charged duet with Holcomb's wife, Ellie Holcomb, on "Black and Blue." Holcomb is still the captain of this band's ship, but Souvenir relies on contributions from the whole crew. It's a proper "band album," in other words, stacked with songwriting contributions from longtime members Rich Brinsfield and Nathan Dugger. Arriving two years after Medicine, a watershed album that cracked the Top 15 on both the Billboard Folk and Rock charts, Souvenir was borne out of collaboration. Holcomb and company had played nearly 200 shows in support of Medicine's release, and the pace took a toll on the frontman. Looking for help to whip up new material, he began holding weekly songwriting sessions with Brinsfield and Dugger. The two bandmates responded by bringing in some top-notch tunes. Dugger came up with "Yellow Rose of Sante Fe," a classic country song whose warm, western sway brings to mind a young Willie Nelson, while Brinsfield wrote "Sometimes," whose stacked harmonies and pop melodies evoke the Beatles. The trio finished an additional handful of songs together, while a solo acoustic tour through Europe gave Holcomb the time to polish off several tunes on his own. Fiercely supportive of his adopted hometown, Holcomb recorded Souvenir in East Nashville, teaming up with the same producers — Joe Pisapia (k.d. lang, Guster, William Tyler) and Ian Fitchuk (Maren Morris, James Bay, Kacey Musgraves) — who helped bring 2015's Medicine to life. Rather than try and resurrect the classic, stripped-down vibe of the previous album, though, the team adopted an "anything goes" approach in the studio. They used a drum machine on "New Year," a song about the annual cycle of triumph and tragedy. They made room for gang vocals, layered guitars, and epic, rock-influenced arrangements. On "Wild World," a socially-conscious song about embracing diversity and loving your neighbor, the crew recorded live, allowing the sounds of the outside world — including a passing ambulance, its siren blaring — to filter their way into the finished track. While Drew Holcomb & the Neighbors worked on Souvenir at Pisapia's home studio, America endured the final days of a dark, contentious election that seemed to leave everyone — both winners and losers — in a state of exhausted unhappiness. There's palpable anger rising from Holcomb's voice in "Fight for Love," whose epic tale of struggle and redemption was recorded one afternoon after Election Day. Souvenir doesn't shy away from those dark corners — the challenges and controversies that help give context and depth to our happier moments — but it does place most of its focus on one central theme: love. "Love is physical," says Holcomb, who kicks off the album with "The Morning Song," his most sexually-charged track to date. "Love is geographic," he adds, pointing to the album's tribute to the Golden Coast, "California." Then, looking at the rest of the 11-song tracklist, he draws connections to songs about estranged brothers, long-lost lovers, precocious daughters, and everyone in between. "Love is hard and tragic," he finishes. "Love is rewarding. Love is friendship. Love is fatherhood." Love is musical, too. One month after recording "Wild World," Holcomb found himself in the ER, once again listening to the blare of ambulance sirens outside. He was soon diagnosed with a rare case of viral meningitis, a disease that left him in the hospital and unable to listen to the finished, mastered mixes of Souvenir's tracks. Years ago, he might've waited until he completely recovered, delaying the album's release until he could personally approve each song. This time, he tossed the job to his bandmates, giving the Neighbors the trust, love, and support needed to finish Souvenir. Released on March 24, 2017, by Holcomb's own label, Magnolia Music, Souvenir is the very thing its name suggests: a keepsake from a band that's still moving, still growing, still scaling new heights. Like Medicine, the album is built around the idea that music helps bind people together. It's the population's connective tissue. It's part of our lives, carried with us from one milestone to the next, always providing the soundtrack to our individual journeys. 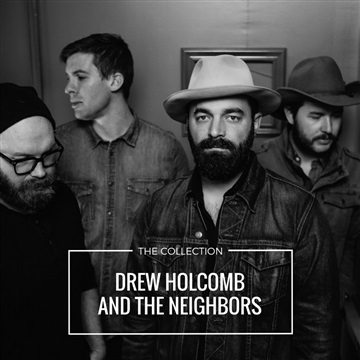 For Drew Holcomb & the Neighbors, that journey is still going. Souvenir is the newest memento from that trip, its songs shining a light on the band's past while also pointing toward the next destination. Onward.